The construction site filmed was near the corner of East 16th Avenue on East Mall, on UBC campus. For this site, construction was taking place in order to prepare the land for a sports field. Existing soil and vegetation was removed to make way for the specially prepared sports field. 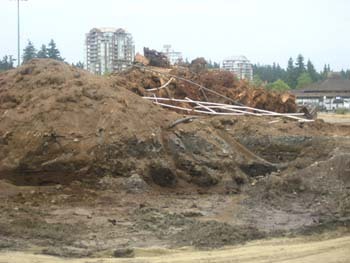 Though topsoil excavated from building sites on UBC campus must be collected and utilized, the increased urban development is disturbing to some. UBC Campus and Vancouver both suffer from the increased pressure to provide urban settings for the growing urban population.